In recent years, there have been a heartbreaking number of ancient monuments and relics blown up, smashed, and stolen across the Middle East and North Africa. In 2001, the Taliban bombed the Buddhas of Bamiyan in Afghanistan. In 2011, the “Benghazi Treasure,” including priceless Hellenistic coins and jewelry, was stolen from a bank vault during Libya’s civil war. In 2014, the façade and relics of the Museum of Islamic Art in Cairo were severely damaged by a car bomb. In 2015, ISIS fighters destroyed Assyrian and Akkadian artifacts at the Mosul Museum, Iraq and bombed the Temple of Baal at Palmyra, Syria. Unfortunately, these are only a few of the recent archeological loses the MENA region has faced. In striking contrast to this violent disregard for the remnants of history that has plagued other parts of the MENA region, the government of Morocco has worked diligently to preserve culture throughout the North African Kingdom. Beginning this September, visitors from around the world will be able to visit one of Morocco’s most recently refurbished ancient treasures: the al-Qarawiyyin Mosque in Fez, commissioned by an influential and visionary woman nearly 12 centuries ago. 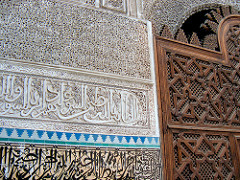 Fatima al-Fihri — a well-educated, wealthy, and pious woman from Qayrawan in modern day Tunisia — immigrated to Fez with her family and a larger community of migrants known as “Qayrawaniyyins.” When her father, brother, and husband died in quick succession, Fatima and her sister Miriam devoted their sizable inheritance to building some of the greatest lasting monuments in Fez. Miriam sponsored the construction of the Al-Andalus Mosque, while Fatima focused her energies and funds on building the al-Qarawiyyin Mosque, which was officially founded in 859 AD and expanded into a university in the tenth century. 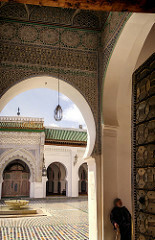 Fast forward to the present day, and al-Qarawiyyin still hosts the oldest continuously functioning library in the world. Its famous university alumni include Sufi mystic Ibn Al-Arabi (12th century), Jewish philosopher Maimonides (12th century), and historian Ibn Khaldun (14th century). Al-Qarawiyyin is renowned for its literary collection of approximately 4,000 rare Arabic manuscripts. This collection includes an original copy of Ibn Khaldun’s Muqaddimah—a work of universal history that contemplates concepts of historiography, economics, Islamic theology, and natural science—as well as an early collection of hadith, a ninth century Quran, and a manuscript composed by the twelfth century polymath Ibn Rushd, also known as Averroes. Unfortunately, in more recent decades, al-Qarawiyyin’s library and university complex declined into a state of architectural disrepair and fragile manuscripts were kept in archives without significant control over temperature or humidity. 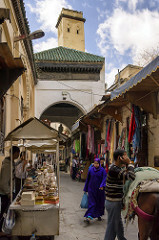 When Moroccan King Mohammed VI ascended the throne in 1999, he recognized the importance of restoring this historic monument and called for renovations. In 2012, the Arab Bank of Kuwait furnished the Moroccan Ministry of Culture with a grant to save the structural integrity of the university architecture and to protect the library’s collection. 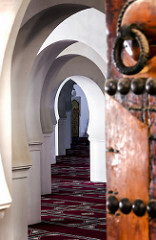 The Ministry of Culture asked Moroccan-Canadian architect Aziza Chaouni, who was born in Fez, to direct the restoration. Like Fatima al-Fihri, Chaouni is a well-educated woman with intellectual and architectural vision. She is a graduate of Columbia University’s School of Engineering, where she focused on civil engineering, as well Harvard University’s Graduate School of Design (GSD). She has been a Research and Teaching Fellow in the Aga Khan Program for Islamic Architecture at Harvard University’s GSD, and she is currently a TED Fellow. 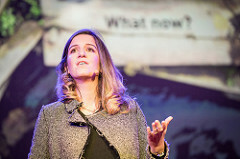 Chaouni is also the principle of Aziza Chaouni Projects and an Assistant Professor at the Daniels School of Architecture, Landscape, and Design at the University of Toronto. Chaouni’s restoration efforts at al-Qarawiyyin have been extensive. She was tasked with modernizing and repairing the library facilities whilst simultaneously maintaining their historical and cultural integrity. She introduced solar panels, a new gutter system, subtly placed air conditioning units, a modern security system, and updates to the sewer and water systems in order to bring the property into the twenty first century. However, her team also made repairs to the library’s broken ceramic tiles and plaster designs, working diligently to ensure that artistic updates matched the original motifs, colors, and patterns. Four years after Chaouni embarked on this ambitious architectural journey, al-Qarawiyyin will officially reopen to the general public in September of 2016. Before these renovations, the library was only open to scholars and theologians for the protection of its collection. This fall, however, visitors from all over the world will have the opportunity to appreciate the architecture, history, culture, and literature of this ancient treasure in a wing of the complex that will be open to the general public. King Mohammed VI is expected to inaugurate the reopening of the library in the near future, although no date has been announced yet for this ceremony. Considering the political (and archeological/historical/cultural) instability that haunts so much of the MENA region today, the significance of the al-Qarawiyyin library and the Moroccan government’s dedication to its renovation cannot be overstated. When so many people around the world live in fear of radical Islam, this library and its collection of enlightened theological texts reminds us that Islamic scholars have contributed enormously to the implementation of law and the practice of peace. When radicals conflate misogyny with Islamic piety, the stories of Fatima al-Fihri and Aziza Chaouni remind us that educated women have long been integral to strong Islamic institutions. Perhaps most importantly, when thieves and terrorists try to erase history elsewhere, the Moroccan government’s dedication to this project reminds us that progressive, stable societies focus on construction rather than destruction.